At Camp Bow Wow New Orleans, we believe every dog should have a loving fur-ever home. We work closely with local shelters and rescues to help with their adoption efforts, and often have foster dogs staying at Camp. These dogs get to play all day with other Campers, snooze the night away in individual Cabins, and get lots of love and attention from our Certified Camp Counselors®. Personality: Meet Jolie! Our newest foster from Kismet Pet Adoptions. She is super sweet, and knows how to take treats like a lady! Jolie loves to play in the yards, and has never met a stranger. She will happily roll over for a leisurely belly rub or sit pretty waiting to give you kisses. 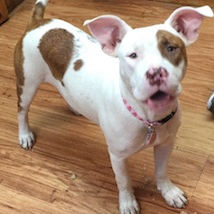 Jolie would do best in a home with another dog she can run around and play with. Or even, a young family that exercises a lot. Jolie comes up to date on shots, and spayed. Adoption Information: For more information or to meet Jolie stop by Camp or give us a call at (504) 891-3647!